4.2 out of 5 based on 22 bloggers and 3 commenters. 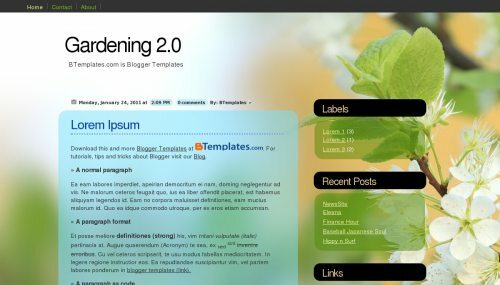 Gardening is a free blogger template with 2 columns, right sidebar, rounded corners, an exclusive design for Blogger and floral motifs. I like this template a lot, but there is one issue why I am not downloading it for my blog. I do not like blue background for the text. Can it be fixed from blue to white? är den gratis?om jag bor i sverrige kan jag fortfarnande ha den då? jag jag ha den på blogg.se?